Each section stacks on top of the one below. You can make just one section, or up to four. Doors lift up and slide back for full access to books. Keeps books and collectibles dust free. Wood dowels in door ends allow doors to swing up and slide back. Eliminates need for expensive metal barrister hardware. 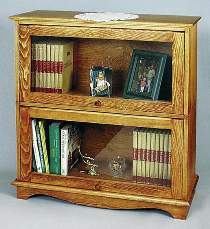 Each bookcase section measures 17”H x 11”D x 33”W. Plan details drawn FULL SIZE.